You have many choices when selecting a service to secure your online privacy. To help you make an informed decision, we continue our in-depth analysis of competing services to see how they measure up against OneRep.com. So without further ado, let’s begin our OneRep vs. PrivacyDuck comparison. Which service offers quality customer service and dedicated support? Who is PrivacyDuck and what do they do? PrivacyDuck staff members present themselves as privacy advocates who provide real opt-out solutions. They claim their service completely removes your personal information from all possible sites and sources in a timely manner. This article will examine whether it’s true or not. 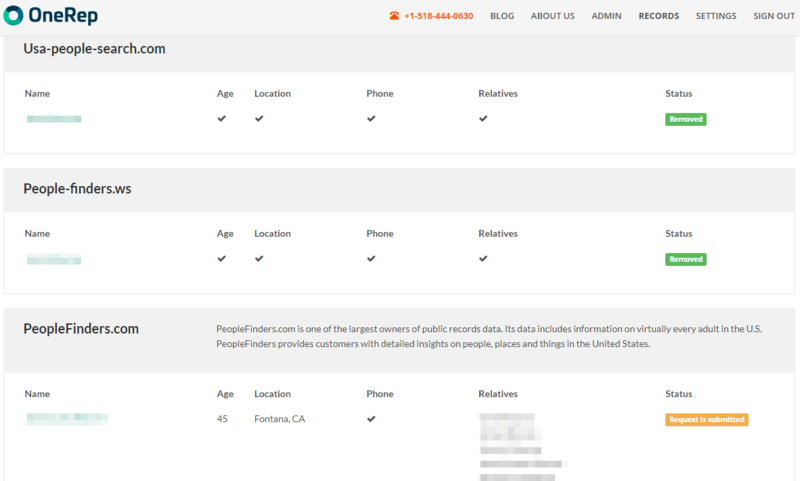 OneRep or PrivacyDuck — Which service removes more addresses, phone numbers, names and AKAs? PrivacyDuck: “We don’t cap how many of your name variations, prior addresses, or other prior data we’ll delete”. OneRep doesn’t place a cap on information removal either. We believe even out-of-date records can compromise your online privacy and reputation. As such, OneRep takes on every task we’re assigned with one hundred percent effort and efficiency. OneRep and PrivacyDuck are both equipped to remove ALL your name variations, addresses, telephone numbers and related information, however, the lion’s share of personal records is usually rooted in the past. As you may know, the removal process can be a hard nut to crack, but OneRep’s got you covered from start to finish. You have nothing to worry about. Just let us know what information you want to protect, and our team will work diligently to help you solve this issue and reclaim your privacy. OneRep or PrivacyDuck — Which is more affordable? OneRep’s series of articles about our competitors clearly shows that online privacy services can cost a pretty penny. Some services are so exorbitant, that it’s literally cheaper to hire a personal security guard. OneRep believes the benefits of online privacy shouldn’t be exclusive to the privileged elite, nor should they cost a fortune; that’s why our price structure and subscription plans are designed to fit most any budget. The table below compares membership options provided by OneRep and PrivacyDuck. How many websites are included for each service? PrivacyDuck’s most affordable plan, Starter Privacy, includes 12 people-search sites for $99, and promises to remove your records, along with the records of any friend, roommate, or relative living at the same address. If you’re looking for something more in-depth, PrivacyDuck’s Basic Privacy includes 86 people-search sites for $499, and their VIP Privacy includes 167 people-search sites for $999. OneRep removes your personal information from 77 websites for $14.95/mo. At first glance, the number of websites PrivacyDuck covers seems impressive. But a closer look reveals it’s all just smoke and mirrors, and intentionally misleading. What most of you don’t realize is that the list contains affiliated websites. What does it mean? Some website, for example WhitePages.com, Radaris.com, InstantCheckMate.com make additional websites to attract more visitors. As a rule, when you remove your personally identifiable info from a parent website, the data automatically disappear from all affiliates. PrivacyDuck counts these sites as separate units. For instance, one of the websites PrivacyDuck covers is CaliforniaBrokers.org, which contains multiple subdomains for many jobs (CaliforniaEngineers.org, Californianursing.org, etc.). Rather than counting the primary domain as just one website, PrivacyDuck counts each subdomain as a separate website, thus padding their numbers with an additional 10 sites to their overall tally. This seems like a blatant marketing gimmick, since it’s unlikely that customers would need access to all of these individual subdomains. OneRep believes in complete transparency, not marketing gimmicks. We remove your personal data from over 77 people-search sites, and you can find a list of the most common websites we cover on our F.A.Q. page. Everyday, our developers find new people-search websites and add them to our list for automatic removal. As a result, the number of OneRep covered websites is growing all the time. In short, Yes. You always have the right to contact the various people-search sites directly and request the removal of your data, even if you don’t subscribe to any of our services. Your private records are your own and don’t belong in the public domain. It’s just flat wrong. 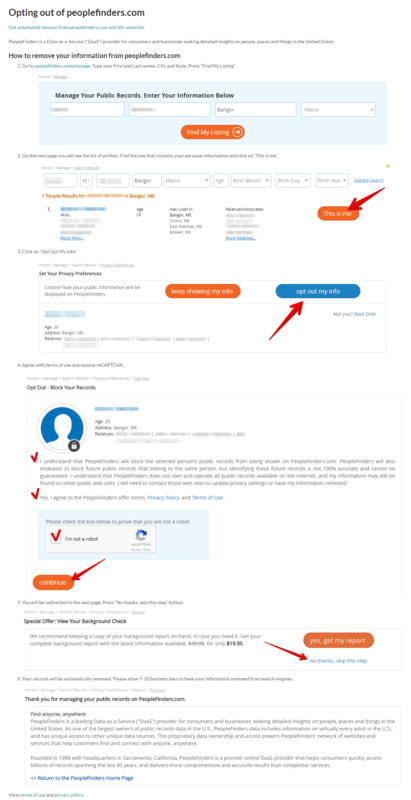 Some online privacy companies offer limited opt-out instructions, others offer no instructions at all. But what about OneRep and PrivacyDuck? OneRep offers FREE self-removal instructions as a courtesy to all our visitors. Our instructions are quite detailed and include screenshots to help you navigate the opt-out process for the most popular people-search websites. PrivacyDuck offers limited opt-out instructions in both video and written format. However, their instructions only include 26 of the websites they work with, leaving you to figure out the rest on your own. How does PrivacyDuck differ from their competitors? Well, they don’t! Privacy Duck: “We’re the only company to delete the cached records from Google after the page is gone”. This simply isn’t true. OneRep also deletes Google’s cached records for all our customers. In fact, any reputable privacy service can, it’s just a question of if they’ll go that extra mile and get it done for you. Google’s search engine is available to everyone, and we all have to play by their rules. Neither PrivacyDuck, nor OneRep can delete Google links on demand. It usually takes 5-10 days for Google to refresh their cache and process any removal requests, at which point, your personal info will disappear from any search results. However, it is possible to expedite the process and remove broken links in just 2 days via this Google Removal Tool. As a courtesy to our customers, OneRep can remove any dead links listed on Google upon request. For more self-removal tips, check out our article, 10 Life Hacks That Help Remove Private Data From the Internet. PrivacyDuck states they “use expertly-trained, real people… – not scraping computer programs that miss items…” But OneRep sees things a bit differently. We believe automated computer programs help reduce the cost of the services we provide, making online privacy affordable to everyone. Besides, don’t forget the so-called human factor. No matter how diligently we work, we all make mistakes, while computers can track any privacy breaches around the clock, 24/7. OneRep and PrivacyDuck both agree that quality customer support is of the utmost importance in the removal process. Should you encounter any technical problems or have any questions about our service, OneRep’s Privacy Experts are ready to provide prompt and courteous assistance. To make the deletion process more efficient, our support team sends faxes, makes calls, and speaks directly with website representatives exposing your info. Additionally, we use computer programs to auto-remove your records from websites that don’t require the human touch. OneRep’s methodology: real people + computer programs = success. What’s OneRep have that PrivacyDuck doesn’t? One key element of any self-respecting company, is a user friendly personal dashboard. Unfortunately, PrivacyDuck doesn’t even have one. OneRep equates a personal dashboard with corporate responsibility and transparency, and we’ve always taken great pride in being above-board. Our personal dashboard allows members to readily see the exact number of people-search websites exposing their information. Moreover, our customers can view exact links and pages where these personal records are located. Additionally, members can check in on the removal process at any time and monitor exactly what’s been accomplished by OneRep’s dedicated team of professionals. Another feature that distinguishes OneRep from PrivacyDuck, is ongoing monitoring, which continually scans the internet to assure removed records don’t reappear without your knowledge. Unfortunately, sometimes removed records can be relisted when people-search websites refresh theirs databases or change their opt-out policy. But OneRep’s ongoing monitoring continually works on your behalf, keeping an eye out for any changes, even after your personal records were removed.